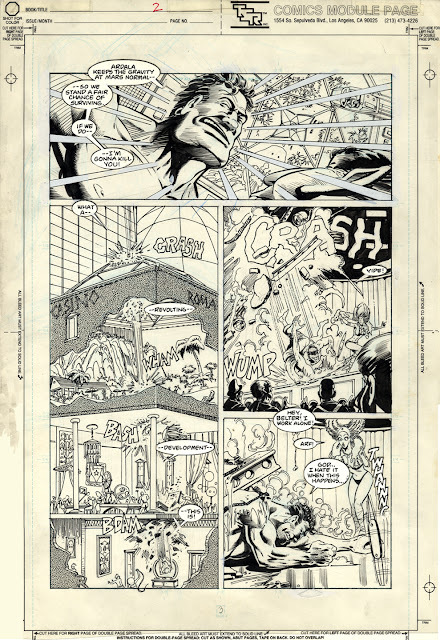 This page was a gift by the artist, Kevin Altieri. It was a page from the "Buck Rogers Comic Module Series" published by TSR (creators of Dungeon and Dragons) in the late 80's during their foray into comic book publishing. One of TSR's Comic Modules (a floppy comic book with a game board and punch-out tokens, as I recall) was Buck Rogers. Black Barney was a supporting character in the Buck Rogers comic strip that TSR had the license for, and they tapped Kevin to illustrate the Black Barney back up feature. Kevin's work was so compelling that Barney took over the "module" with issue 4, lasting until "module" 6; the book reverted to featuring Buck Rogers with module 7. I assume that was because Kevin no longer had time to draw the series as he was one of the directors on the Batman Animated tv series in 1991. I know all this because Kevin was a friend of mine. I had met him in 1984 as a fellow storyboard artist on the Kid Video TV series for DIC Entertainment. He was promoted to Director, guiding the creative team I was part of on "The Real Ghostbusters", "ALF", "ALFtails", and "Pegasus". During this mid-80's period, I was trying to break into comics, doing new samples and being repeatedly rejected. I had given up trying to draw comics by the time Kevin's work on Black Barney appeared. Seeing it gave me hope there might be space for me in the comix industry after all, and I renewed my efforts to break in.